"Share the journey. Share the laughter." 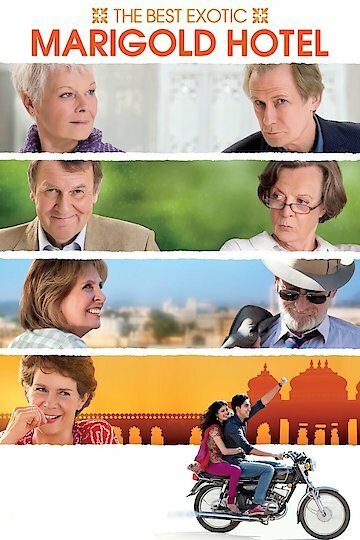 The Best Exotic Marigold Hotel is a vibrant film that is equal parts comedy and drama. Judi Dench plays Evelyn, a recent widow who discovers that she must sell her house because her late husband has left her in a tremendous amount of debt. She then heads to India where she meets several other people who have decided to move to the country for various reasons. Graham, Jean, and Doug all decide to retire to India for different reasons. Muriel is seeking hip replacement surgery which is done in India relatively cheaply. Madge is focused on hunting for a new husband. Norman is a ladies’ man who does not want to accept his old age and thinks India will allow him to stay young. All of these people end up staying in the same hotel in India where they try to acclimate to the country with varying degrees of success. Graham and Doug love to explore the city together. Jean, on the other hand, never wants to leave the hotel and she spends most of her time there reading books and staying away from stress and drama. Evelyn starts working her first job ever. Madge and Norman begin an affair with each other. All of the people undergo dramatic changes and growth while living at the hotel. Graham finds an old lover from his youth and they reconnect. Jean, who is married to Doug, tries to begin an affair with Graham until she finds out that he is gay. Jean and Doug fight and discover that they are both unhappy in their marriage. Jean decides to leave Doug and he ends up beginning a relationship with Evelyn. Muriel discovers that she has an aptitude for finances and she ends up taking over as assistant manager of the hotel. Everybody then lives happily ever after. The Best Exotic Marigold Hotel is currently available to watch and stream, buy on demand at Amazon, Vudu, Google Play, FandangoNow, iTunes, YouTube VOD online.